The violence of twelfth-century Japan explodes in this half-legendary, half-true story of a violent man who becomes a folk hero. A heartless savage, the Ronin, or "wandering samurai," slashes his way up from the gutter to wealth, honor and status. In spite of his crime sand bloodthirsty cruelty, he bears the strange mark of destiny that the wise see and respect, even as he destroys them. 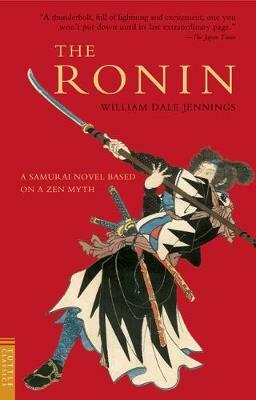 The tale which is told with humor and irony, ranges from the pleasantly colloquial to the brutally satiric, yet never relents in the Ronin's ruthless search for the truth. The storyteller hides nothing and speaks bluntly, yet this jewel-like tale shimmers with tantalizing riddles that will haunt the reader just as they haunted the Ronin. Sure to shock, confound and ultimately inspire readers, The Ronin is loosely based on an ancient legend told to the author by the Zen Master Nyogen Senzaki. William Dale Jennings was a novelist and gay-rights pioneer. His novel, The Cowboys, was adapted for film and starred John Wayne and Colleen Dewhurst.